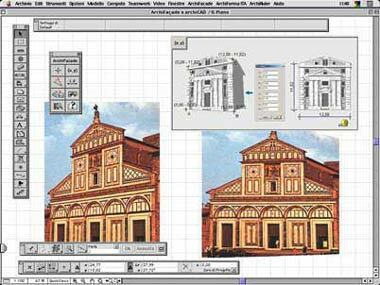 Plug-in di ArchiCAD per il raddrizzamento di immagini prospettiche. ArchiFaçade è un’estensione che utilizza la tecnologia API (Application Program Interface) per aggiungere nuove funzionalità ad ArchiCAD. Il plug-in consente agli utenti ArchiCAD diintervenire su delle immagini digitali prospettiche(fotografie di facciate, oggetti o quant’altro) edottenerne il raddrizzamento. Il Plug-in si basa sui principi della geometria proiettiva: attraverso le opportune trasformazioni matematiche, i punti che compongono l’immagine deformata dalla prospettiva possono essere modificati, fino a comporre l’immagine raddrizzata. La palette degli strumenti diArchiFaçade compare, a richiesta, e il suo uso è identico a quello di qualsiasi altra palette, offrendo un metodo semplice e rapido per ottenere il prospetto di un edificio. Il rilievo diretto di un edificio alto, magari ricco di modanature, di elementi e di particolari architettonici è lungo, faticoso e difficile. La soluzione più rapida ed efficiente è quella di digitalizzare la propria fotografia e, con l’ausilio di ArchiFaçade, ottenere in pochi istanti un’immagine “raddrizzata”, in cui le misure delle singole parti hanno le stesse proporzioni che nella realtà. Avrete bisogno unicamente di poche misure, ArchiFaçade fornisce infatti due semplici metodologie per il raddrizzamento dell’immagine prospettica. Nel primo caso basterà indicare, sulla foto importata nella pianta, le coordinate reali di quattro punti noti, con il secondo metodo è sufficiente indicare un segmento di dimensioni note che identifichi un allineamento (orizzontale o verticale) della prospettiva, dagli estremi del quale vanno trilaterali due punti sullo stesso piano della facciata. Il programma permette anche di cancellare le parti indesiderate dalle immagini bitmap consentendovi di rifinirle e aggiustarle come desiderato. Infine, grazie ad una semplice procedura grafica, potrete trasformare le vostre immagini fotografiche in elementi di libreria ArchiCAD così da utilizzarle nelle vostre ambientazioni foto-realistiche. Immagini di persone, alberi, quinte di edifici qualsiasi immagine potrà essere usata con estrema semplicità e velocità di calcolo nel vostro modello tridimensionale senza dover ricorrere alla programmazione GDL o all’uso di altri programmi. I just want to say I am just newbie to blogs and definitely enjoyed this web-site. More than likely I’m want to bookmark your blog post . You certainly have fantastic article content. With thanks for revealing your web site. I do agree with all of the ideas you have presented to your post. They are really convincing and can definitely work. Still, the posts are very brief for newbies. Could you please prolong them a bit from subsequent time? Thank you for the post. Generally I don’t read article on blogs, however I wish to say that this write-up very forced me to try and do it! Your writing style has been amazed me. Thank you, very great post. You are my breathing in, I own few web logs and sometimes run out from post :). “Truth springs from argument amongst friends.” by David Hume. My wife and i were so comfortable when Edward managed to complete his basic research through your precious recommendations he received when using the web page. It’s not at all simplistic just to continually be freely giving procedures which people today may have been selling. And we also figure out we have got the blog owner to appreciate for that. The specific illustrations you’ve made, the easy website navigation, the friendships you make it possible to create – it is most powerful, and it’s really leading our son and us reason why the situation is excellent, which is quite indispensable. Many thanks for the whole lot! I enjoy you because of your own efforts on this website. Ellie loves getting into research and it’s easy to see why. Many of us hear all relating to the compelling manner you create important items on the website and therefore invigorate response from visitors about this article so our own girl has always been learning a great deal. Have fun with the remaining portion of the new year. Your carrying out a useful job. F*ckin’ tremendous things here. I’m very glad to see your article. Thanks a lot and i am looking ahead to touch you. Will you kindly drop me a e-mail? I must show my appreciation for your generosity supporting all those that really need help on this one question. Your very own commitment to passing the message all-around had been rather important and has consistently helped people like me to reach their dreams. Your amazing insightful suggestions means a lot to me and substantially more to my office colleagues. Thank you; from each one of us. I do accept as true with all of the ideas you have introduced to your post. They’re really convincing and will certainly work. Nonetheless, the posts are too quick for novices. Could you please extend them a bit from subsequent time? Thank you for the post. I¡¦ll right away grasp your rss feed as I can not to find your email subscription link or newsletter service. Do you’ve any? Kindly allow me recognise in order that I could subscribe. Thanks. Some genuinely nice and utilitarian information on this internet site, also I believe the style holds excellent features. I really enjoy reading through on this site, it has fantastic articles . “You should pray for a sound mind in a sound body.” by Juvenal. Good day very cool blog!! Man .. Excellent .. Amazing .. I will bookmark your blog and take the feeds also…I’m happy to seek out so many useful information right here within the put up, we’d like develop more techniques on this regard, thank you for sharing. It’s truly a great and helpful piece of info. I am happy that you just shared this helpful information with us. Please stay us informed like this. Thank you for sharing. It’s the best time to make some plans for the future and it’s time to be happy. I’ve read this post and if I could I want to suggest you few interesting things or tips. Maybe you can write next articles referring to this article. I desire to read more things about it! hello!,I like your writing so a lot! percentage we keep in touch more about your post on AOL? I require an expert on this space to solve my problem. May be that’s you! Taking a look forward to look you.